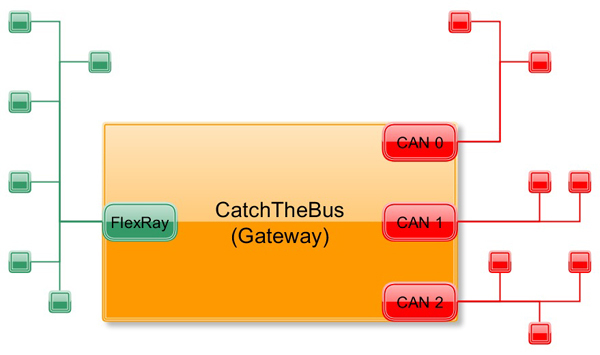 If you are looking for a solution to implement a complex FlexRay-to-CAN gateway, Explinovo’s freely programmable ECU CatchTheBus will fulfill all your expectations. It offers up to five CAN and one FlexRay (channel A+B) buses letting you transmit and receive information to and from several separated communication networks. A gateway is being needed when different bus communication systems need to exchange data. For example if you integrate a safety critical subsystem (e.g. a Drive-by-Wire application) using FlexRay as communication bus into a standard production car using CAN bus. Developing a FlexRay-to-CAN gateway is never an easy and straight forward task. As a matter of fact you need to make a bridge between the static frames of the FlexRay bus which are arriving at predefined instants and the asynchronous CAN messages. You need a perfect timing control and coordinated tasks to optimally use the resources of your FlexRay-to-CAN gateway. The job is often not done by simply routing a message from one bus to the other. Your gateway might interface a complete subsystem. You might want to implement a subsystem behavior logic to integrate this subsystem into your main communication network. You also might want to manipulate signals (filters, arithmetical operations, …), group signals from different messages into one new frame or even emulate a complete ECU with complex inter-activities with other nodes. So quite quickly your gateway application reveals itself to be quite a complex project. CatchTheBus offers you everything you need as a FlexRay-to-CAN gateway to master all of your challenges. You can define your different tasks very simply and synchronized them to the FlexRay bus. You can manipulate every signal as you want and add any logic and algorithms easily. You develop the complete firmware by only using the C language. CatchTheBus sets a big bunch of functions at your disposal to be able to initialize, read from and write to any communication bus. By the way, CatchTheBus not only support CAN and FleRay but also LIN, RS232, Ethernet and Powerline Communication.